It’s a finish! I love finishes. This is my Beginner Quilt Lessons sample quilt. Its finally quilted and finished off with binding. Are you a beginner quilter? Do you want to learn to quilt? Then do it. Beginner quilt lessons found here. Templates available on my no3quiltstudio craftsy store. Past participants best work found here. The Amethyst beginner sample quilt was developed in 2015. I was very new to quilting and designing and writing a pattern was a huge challenge to myself. I then set out to develop a beginner sampler quilt with my newly bought EQ 7. The quilt would take a person wanting to learn how to quilt through all the necessary quilt skill building blocks. With these blocks you can make so much more. You can make them into a stand alone project or combine a couple of blocks to make baby quilts, cuddle quilts, cushion covers or bed quilts if you are so inclined. The first block of the series is a basic block the humble four patch block. I love the four patch block. You can make an entire quilt out of it or use it to make a lovely border as I have done in my quilts below. The second block is the elegant Pinwheel Block. This block is essentially made by making for Half Square Triangles (HST). The HST is a hero in the quilting world, it works well to make quick easy quilts or to make as a background if you are making applique quilts. The fourth block is the Log Cabin Block. This is an amazing block and I have designed a few quilts using this block as its so versatile. My most recent log cabin design is the Purple Delight Quilt Along do check it out. The fifth block is the Twist which teaches how to use foundation block techniques or paper piecing. I like to use a non-paper base to make my foundation blocks but you can also use the paper piecing method. I love this block so much that I used in a border of one of my quilts and enhanced the block with embroidery at the centre. 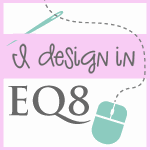 This was in the days when I did not have EQ8. The sixth block is using Applique Techniques. To be honest I find Applique challenging so I have developed my own way of doing Applique do check it out here. With this technique I have made the Seasons of Canberra which will be published in the Australian and Patchwork Magazine in May 2018. So keep an eye out for that. The seventh and the final block is the Attic Window Block. This block tips the scale on challenging. It shows you how to work with ‘Y’ seams. I have a little video on how to exactly sew ‘Y’ seam here. Don’t wait for too long, jump in and make your first beginner quilt! Online Beginners Quilt Course – Participants Best Work!